Compared to paved surfaces, gravel driveways tend to last longer, cost less, and are much easier to maintain and repair. The assortment of aggregate also helps absorb water into the soil, making run-off and erosion less of a concern. But in order to get the most out of your surface, you must first ensure that a proper base is established before the top layer is placed. 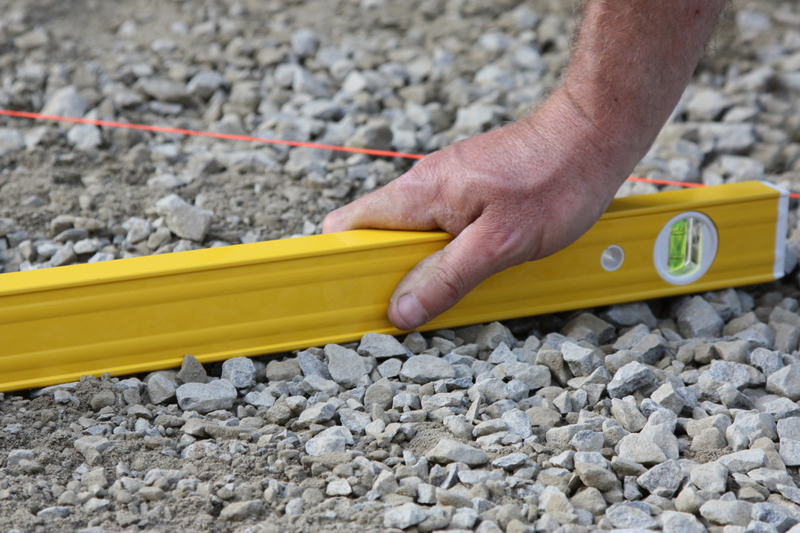 To help you navigate the process, here are a few steps to laying a gravel driveway base. If you’re putting in a gravel driveway for the first time, you’ll want to determine where exactly it will be. Ideally, the surface should be at least 14-feet wide. For stability, clear away any debris—including large roots—and remove the topsoil until you’ve reached a harder layer. If you prefer to add a border or side form to your driveway, now is the time to do so. Mirafi is a woven geotextile fabric that is placed over prepared soil to help stabilize the surface. This breathable fabric allows water to pass through while providing enough strength to support additional weight, as well as minimize the risk of potholes. A solid gravel driveway should be composed of multiple four-inch layers to help prevent it from shifting or sinking with time. The first layer should consist of screen gravel—a larger assortment of sharp aggregate. Due to their unique shape, these stones are less likely to mix in with underlying soil. When compacted together, these sharp pieces will also reinforce one another and function similarly to one solid piece of rock. Compared to screen gravel, crusher run is a relatively smaller combination of aggregate. It is combined with sand dust to minimize void content. This low void content will help provide a solid layer that is more reliable than soil, allowing your driveway to support heavy weights for years. Once the base layer is put down, a final top layer of small gravel should be placed on top of the crusher run. After compaction, the total thickness of the driveway should be at around 12 inches. It’s also important to add extra gravel—also known as a crown—in the center of the surface, as this will help with drainage and prevent washouts. Understanding that a gravel driveway installation takes care and precision, Syracusa Sand & Gravel is proud to offer state-of-the-art resources to help ensure your home improvement project is a success. Carrying a diverse inventory of gravel products, this Ontario County, NY, distributor will help you choose the right materials for every layer of your driveway. In addition, these specialists can assist you with budgeting, planning, and delivery to streamline every part of the installation process. To learn more about their products and services, visit this stone supplier online or call (585) 924-7146. Other Announcements, Events and Deals from Syracusa Sand & Gravel Inc.
A. Syracusa Sand & Gravel Inc.